Yhunger has developed educational resources and training workshops for youth workers that focus on 'hands on' skills development with young people. To engage young people aged 12-24 years old experiencing or at risk of homelessness and to help them develop skills in healthy eating and physical activity. Improves development of life skills and the health of at-risk young people. Connects young people to education, employment and housing programs. Encourages youth services to prepare, cook, provide and store healthy food and drinks. Encourages youth services to engage young people in regular physical activity. Encourages youth services to develop and implement policies and practices that will help young people increase their living skills in healthy eating and physical activity. July 2015 - Pilot training programs. First pilot workshop held in Lismore. Implementation - The initiative is ready for implementation. Research findings indicate that young people who received support, including independent living skills training when transitioning from care and/or supported accommodation, were more likely to complete compulsory education, be currently employed and living independently, and less likely to become young parents1. Grace et al2 found that appropriate education and support to acquire basic living skills is essential to avoid returns to homelessness. most had inadequate intakes of vegetables, fruit, dairy products, and bread and cereals. Youth service managers and workers were also interviewed. They believed their services could play a greater role in providing healthy food and developing young people’s knowledge and skills in selecting and cooking healthy food3. Young people experiencing or at risk of homelessness face many challenges, including disrupted education, poverty, and lack of family or social support. To survive independently, their needs include secure accommodation, income support, employment or education and basic living skills. Yhunger works with specialist youth homelessness and associated services to develop young people’s living skills, so they learn to select and cook healthy and affordable food. Yhunger’s 'learning by doing' approach is particularly suitable for young people with disrupted education and/or low literacy levels. 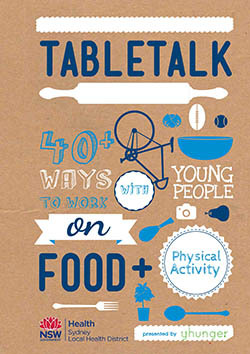 Development and production of Tabletalk, (a manual of activities for youth workers to use with young people) and Brainfood (32 fact sheets for young people). These publications will be printed in July 2015, and will be available to youth services and health services participating in Yhunger workshops, as well as other interested organisations. 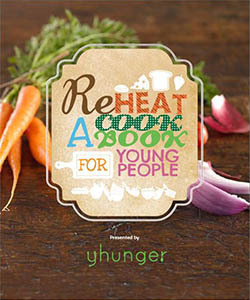 Two other Yhunger cookbooks – Reheat: A Cookbook for Young People and Made Fresh: More Mad Feeds – are available on the Yhunger cookbooks page of the Health Kids website. Training workshops for youth workers will provide them with the knowledge and skills to implement the program in their service. At the workshops, youth workers learn how to cook recipes from the Yhunger cookbooks with young people. A pilot workshop in Lismore for Northern NSW Local Health District is scheduled for 29-30 July 2015 and in Sydney during September and October 2015. Youth homelessness services and other youth services in SLHD. Youth Health Service and non-government agencies in SLHD, such as Red Cross. Health promotion services in other local health districts. A series of indicators for evaluation was developed, focusing on policies and practices of youth services. Indicators for the program are as follows. The service includes vegetables as part of lunch and dinner each day. The service provides fruit at least twice a day. For breakfast, the service provides at least two of the following food types: dairy; fruit and/or vegetables; bread or cereal; and protein such as lean meat, egg or a vegetarian equivalent such as tofu. The service has a written policy of providing healthy food and drinks. The service provides tap water as the drink of choice. The service provides foods which take into account the cultural and/or religious practices of young people attending the service. The service has a written policy to meet all food safety requirements. The service has a written policy to encourage regular physical activity. The service’s program includes structured physical activity for a range of abilities and interests. The service’s program includes opportunities for young people to participate in planning, preparation and cooking of healthy food. These evaluation indicators will be trialled with participating youth services, following the pilot workshops in Lismore and Sydney. As youth health and homelessness programs run across several sectors, policy changes in one portfolio can have cascading effects on a number of programs. Several policy changes, including changes to homelessness services associated with the Going Home, Staying Home program (NSW Family and Community Services) have affected implementation of Yhunger. Everson-Hock E, Jones R, Guillaume L et al. 2011. Supporting the transition of looked-after young people to independent living: a systematic review of interventions and adult outcomes. Child Care, Health and Development . 37(6): 767-779. Grace M, Keys D, Hart A, Keys B. 2013. Step ahead: Young people’s stories of overcoming homelessness. Melbourne: Vulgar Press. Crawford B, Yamazaki R, Franke E et al. Sustaining dignity: food insecurity in homeless young people in Sydney, Australia. Health Promotion Journal of Australia 2014; 25: 71-78. Crawford B, Yamazaki R, Franke E et al. 2015. Is something better than nothing? Food insecurity and eating patterns of young people experiencing homelessness. Australian and New Zealand Journal of Public Health 2015; published online: 22 April 2015. DOI: 10.1111/1753-6405.12371. Franke E, Yamazaki R. 2013. 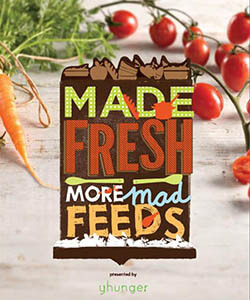 Made Fresh: More Mad Feeds. Sydney and South Western Sydney Local Health Districts. Franke E, Yamazaki R. 2013. Reheat! 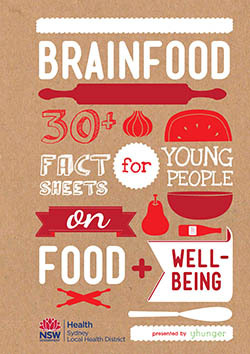 A cookbook for young people. Second edition. Sydney and Sydney South West Local Health Districts.